Come Junk With Us has a new home! We will no long be posting information on blog spot. Our new home allows us to get more information to you. It will be much easier for you to find information on the events you want to attend and to see what we have planned. We can't wait for you to join us. This is news that you will want to take to Starbucks or the water cooler to share! Have you ever been to a Queen of Tarte Sale? I hadn’t either. Until yesterday. but never at an actual barn burner of a sale at her actual beautiful castle/barn. King of Tarte’s mother had baked some of the most beautiful Valentine’s Day cookies. On top of beautiful they were GOOOOOOOOOD! I couldn’t stay out of them. It’s possible I won’t be invited back unless I can prove that I have eaten first before attending. Walk through the barn with me! My pictures are never good and I promise if I ever go again I’ll drag Amber from Tres Birds Photography with me to do the photos. My pictures just don’t do The Queen of Tarte justice, but you get a little bit of an idea of what is goin on here. I loved these paper flowers that were hanging every where. Lots of fun Valentine’s Day stuff. Most of it was gone before I could even get pictures of it. Ms. Thang has done gone and developed herself a signature scent of candles that is TO DIE FOR! It’s so springy that it makes you want to bust out the flip flops and go buy daffodils or tulips. I loved these pleated pillows. Beautiful! This was a really fantastic sale. It put me on sensory overload. Queen of Tarte has it all goin on. On my way home from this sale I had lots of time (4 hours to be exact) to think and reflect on the past 2 years that got me to this sale. When I first started going to these shows a couple years ago I knew nobody. I only read the blogs. 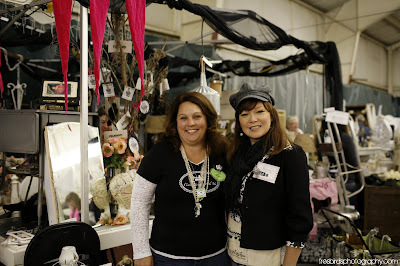 Lisa at A Thing For Roses was the first person I met. Then it was was Isabel from Masion Douce, then Joy from Auntie Joy and the Boys of Barn House. From there on ………I was greeted with open arms ( literally, a hug and a “I’m so happy to see you”) every time. 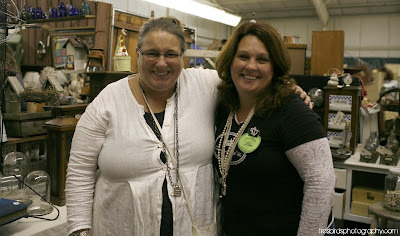 Each time I went to a sale, a craft workshop, or a shopping excursion I always met someone new. After awhile they were introducing me to new friends that were in my neighborhood. Blogland is a small small world! 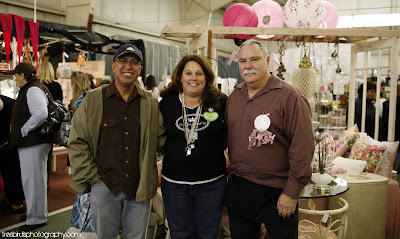 I was so attracted to how these talented people had met all through the love of junkin, decorating and crafting. What even impressed me more was how they all helped each other. They wanted everyone to be successful at what he or she was doing. If someone had some notoriety, and idea, or something fun going on they all were excited for that person and did whatever they could to help. It got me all choked up every time I witnessed it. I wanted to be part of it. I wanted to help. When you can’t sew, you don’t have a eye for decorating, and a glue gun isn't’ your friend you’re pretty limited on what you can do. You’re not usually the first person they call to come help. That’s when a big giant light bulb went off…….Why don’t I take ladies just like you to sales they normally wouldn't’ go to? Come Junk With Us was born! They have all been so supportive in getting our first trips off to a great start. Now with my big Superbowl of all trips coming up, do you know what all these friends I have met over the last couple years have done for me? 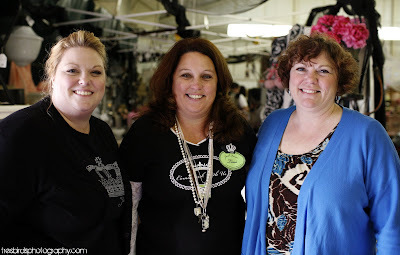 Junk Junket while shopping with some of their favorite vendors. Who is attending you ask? The Junk Junket to Farm Chicks. You don't want to miss any of these details! I got some fantastic news last week straight from Farm Chicks. I will soon be sharing this little bit of information with everyone. In fact I would bet you can hear me screaming it from my rooftop! Come Junk With Us will be hosting a sale! We are really excited also. 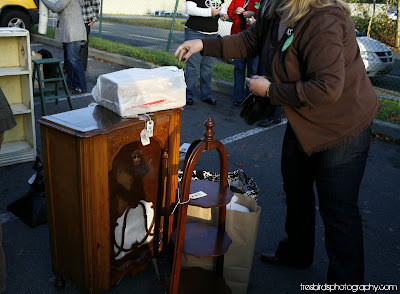 Come Junk With Us will also have a booth where you can purchase tickets to the upcoming Farm Chicks Junk Junket. We have some really great vendors coming to this event. Just to name a few of the vendors participating. Your favorite vendors, bloggers, and shop owners will be handing out coupons for a discount entry for the Saturday show. Stay tuned. We will be giving out that information as it comes in. For sure you will be able to get on right here! Make it a girls weekend! A weekend get away with your significant other. We can give you all kind of places to visit while you’re here. Call them up and tell them your with Come Junk With Us and they will hook you up! Would rather bring the RV? I got that information for you also. $44 a night full hook ups. I’ll hook you up for a great weekend! Let’s just get it over with right away. That way it’s less painful. We had to cancel the December 5th My Favs Junk Junket. Due to unforeseen circumstances we weren’t able to go on this Junk Junket Saturday. Very disappointing but the show must go on. And on it will go! I’m so excited about it I can hardly stand it! We have talked about it in the past but here it is. 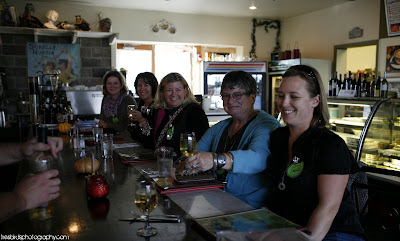 2010 Farm Chicks Junk Junket! Here’s the plan so far. The details are still coming together…………………………. Leave Friday mid morning, get to Spokane, check into hotel, rest and freshen up, then head out for dinner. Saturday morning get up bright and early and be at Farm Chicks to be the first through the door. Shop all day at Farm Chicks, return to hotel for some rest and freshen up. Then we’ll go to dinner. Sunday morning get checked out of hotel, load up treasures on the bus, head over to Farm Chicks to make one last pass through, and then head home. I will have more details of times, stops, and special offers as we get closer to the event. 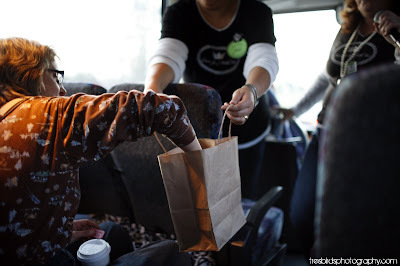 These prices include your transportation, meals, show admissions, hotel, and all the usual Come Junk With Us exclusives. Want to drive or fly into Seattle to join us? We are working with on special hotel rates for you on Thursday night and Sunday night and shuttle service to and from SEATAC airport. We have had so much fun at The Farm Chick Shows over the years and I’m so excited to share this with a Bus load of new friends. Over the next few months we will be planning other Junk Junkets and posting the information here. 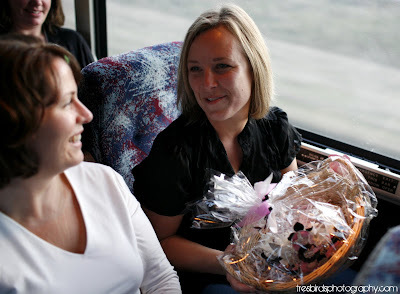 We will also be blogging about The 2010 Farm Chicks Junk Junket details as they start coming together. 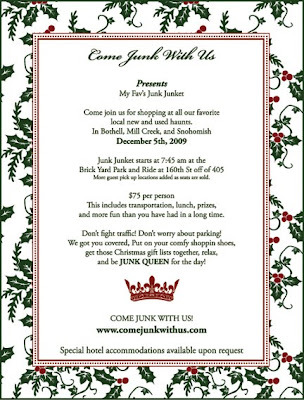 Come join us for this special holiday Junk Junket where Come Junk With Us will be taking you to all my local haunts that are a mix of stores with beautiful new items and stores with fantastic treasures. Let us take some of the hassle out of holiday shopping. Don't fight traffic, don't look for a parking space, don't fight the crowds at the mall, and don't worry about a thing! All you have to do is put on your comfy shoes, your eatin pants, bring your Christmas list, and we will do the rest. Heck we'll even carry your packages for you! From there we will be heading into Bothell, Mill Creek, and then to Historic Downtown Snohomish. If you would like to come join us from out of town no problem! I have arranged for hotel accommodations locally. We will pick you up at the hotel! A 4 star hotel has given me a great rate so that it doesn't put a big dent in your shoppin funds. You know how I love a good deal! Gather up your best shopping buddies and make it a girls weekend! 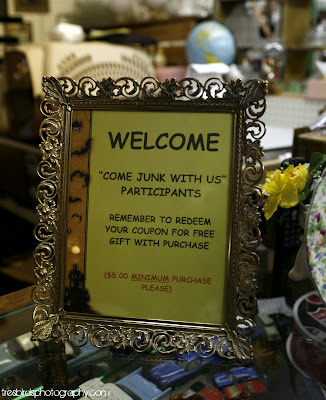 Come Junk With Us isn't just about junkin, it's about shoppin, havin a good time with friends, food, and laughing until your sides hurt. Well, there are the prizes too! 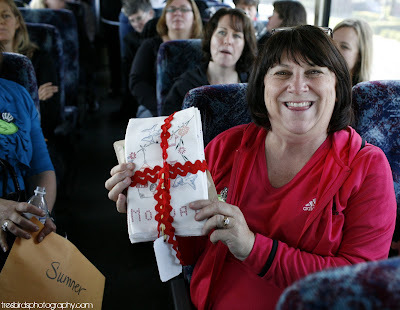 I love to give away prizes!!!!! a lot of My Favorite Things. All seat purchases are non refundable. Come Junk With Us reserves the right to cancel any Junk Junket for any reason. If a Junk Junket is canceled by Come Junk With Us at that time money will be refunded for seats purchased. a 3 day Farm Chicks Junk Junket is coming! After months of planning the day finally came. Saturday October 24th was here! 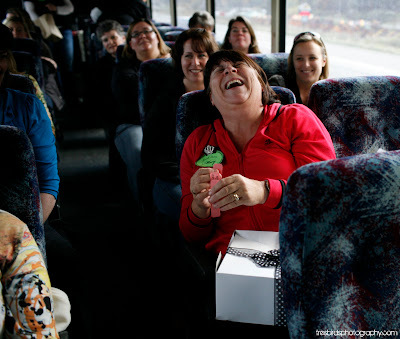 I was so excited to share with my old friends and new friends all the places and surprises I had in store for them. Charm bracelet's, necklaces, Mary Jane's Farm Magazines, and coupons. 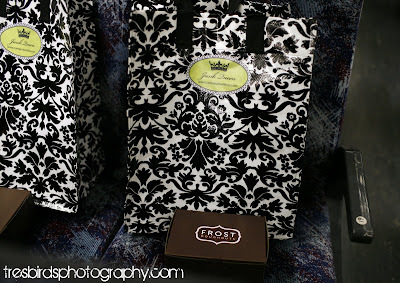 A personal box of Frost Doughnuts. Let the prize drawings begin! The whole day was filled with gift giving. Michelle won the first gift. 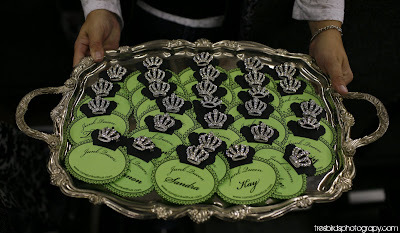 A very cute crown that Shelly from Bungalow Bling had made. 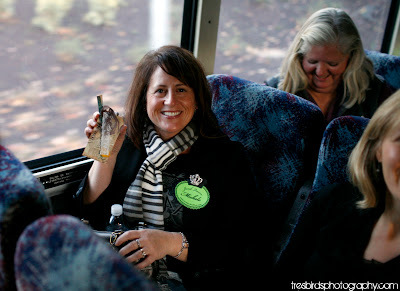 It was perfect since Michelle was on the bus because it was her birthday! 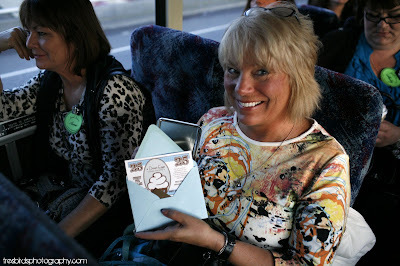 Cathy won the gift certificate from A Dozen Eggs. We told her how wonderful Laura is and what a beautiful job she does on those hand iced cookies but Cathy is going to have to experience it. She will be hooked just like me! Dianne is a local author who has some fabulous cookbooks out. Dianne was very generous to this Junk Junket. We can't thank her enough for all the gifts she donated for giving away. Perfect for those super cute family photos Michele is known for in her Christmas cards. Do you have your family, pet, kids, or significant other photographed for Christmas yet? You better call Amber right away! 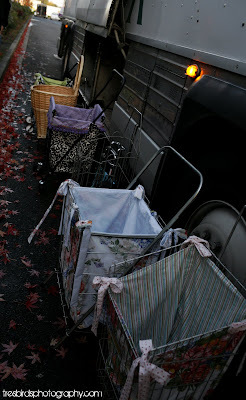 Shopping carts lined up and ready to go. 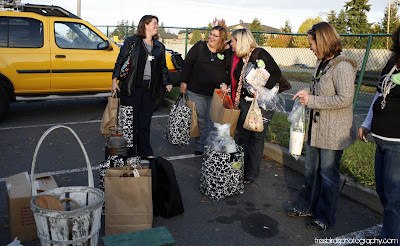 Sheryl was the winner of one of the two shopping carts that were raffled off. Lori the winner of the other. 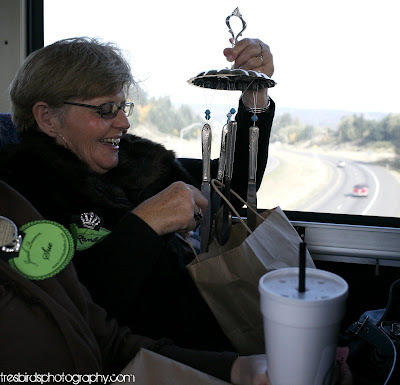 I do believe these ladies found them quite handy! She and Bob have been a great help to me over the last couple months. I can't thank them enough for all their hard work they put in to this show and gifts for the Junk Junket. 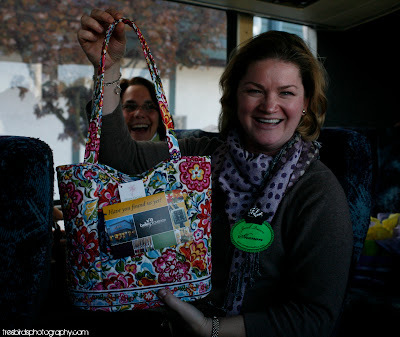 Randi was the winner of the Salvage Studio gift. 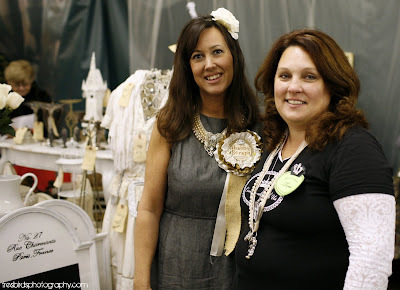 Tiffany at Shabby Scraps was a big gift giver on this Junk Junket. I can't say enough nice thing about her and her beautiful gifts. My Sakuma Berry pickin buddy! She donated the cutest necklaces for the gift bags. 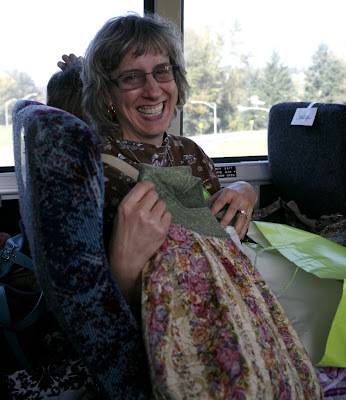 She made one for everyone on the bus! Is this not the cutest picture? They had the prettiest pink booth. Can't wait to see them at Sandpoint next month. Charlene with Freshly Doug Vegetables was another big contributor on this Junk Junket. Charlene made those cute tea towels for a give away. Lots of room on that bus for whatever you want to buy! The Hubs loadin it up!!!! 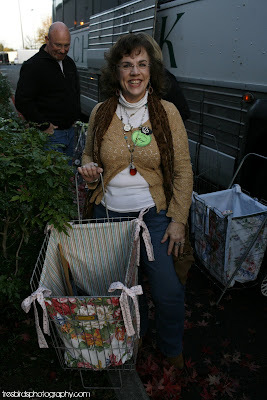 Kay was the winner of the Amy Butler Birdie bag that was hand sewn and donated by Pat. 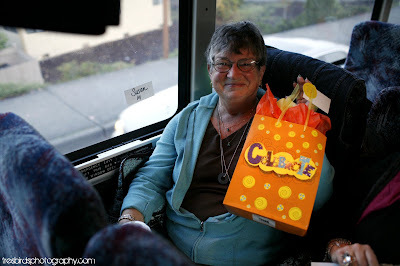 Pat was on my last bus to Barn House. She is also my newly adopted Mother-in-law! She donated this bag AND......made the shopping cart liners that we raffled off. This was a gift with purchase at the Whistle Stop Antiques. then put them in these super cute little jars with candy. Belle Provence. One of my FAVORITE stores in Mill Creek Town Center. They got all the merchants to help, they made suggestions of what to do, where to go, and were my contacts were for whatever I needed in Sumner. Today's Country Store. It's a junkers paradise! The lunch Sorci's provided for us was so stinkin good we all had to go to the restaurant and try a few more things on the menu. What a great little find this place was. The Hubs assuring Charlene that it was totally OK that she bought this wash machine. We had a way to get it home! 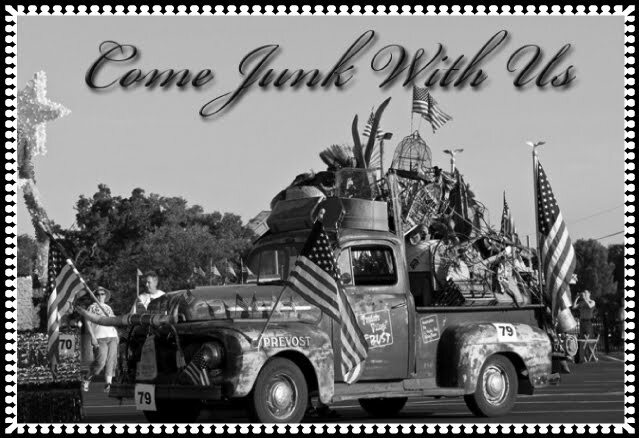 Come Junk With Us wants to make sure that if you want to buy something, we can get it back to your vehicle at the park and ride. Mary won a pie in the raffle. My mom had made apple pies and brought them all boxed up pretty. 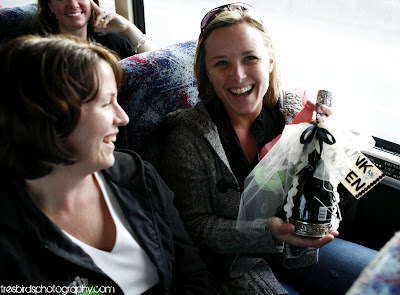 Michelle won not only the cute crown at the beginning of the day but the bottle of champange also. What a great birthday for her! 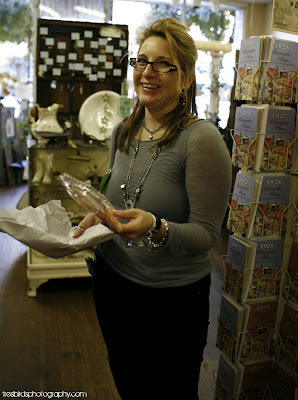 Vera Bradly Hopes Garden mini hipster with a $100 Come Junk With Us gift certificate. We have been friends since 4th grade. Mary with a fabulous find. I bet this is for that new grandbaby shes getting for Thanksgiving. Oh my gosh! I almost forgot! How stinkin cool is this? Sheryl Donahue who makes fantastic jewlery gave this super cute necklace for a give away. My Faux Aunt Reta won it. This was my neckless that Sheryl made for me. It's lovely and you will see it hanging around my neck for every Junk Junket. We might just have to see if we can't get Sheryl to make these so everyone can have one. The two ladies who taught me that life is all about the adventures, road trips, good food, trying to get the perfect picture and laughing until your sides hurt. 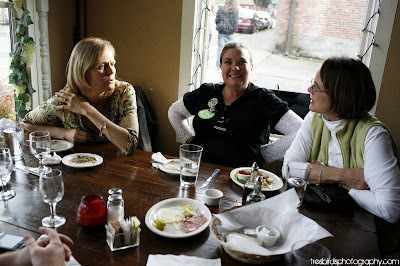 We met new friends, we junked, we ate, we laughed, we junked, we ate, we laughed, and we junked some more. Thank you everyone for joining me on this Junk Junket. I can't wait for you to Come Junk With Us again. Now it's time to show some blog and website love to all those who made this trip possible. 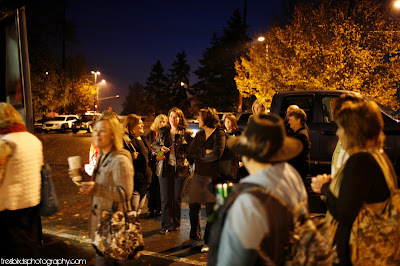 We will be going to all my favorite places here in the Bothell, Mill Creek, and Snohomish area. A Timilious Turkey Dip for lunch along with some of my favorite things for gifts. If you would like to come from out of town I have arranged a special rate at a hotel where the bus will pick you up Saturday morning. 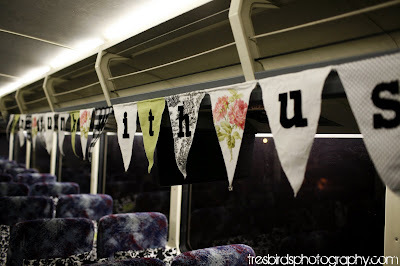 Come Junk With Us will be organizing a bus to The Farm Chicks in June! Tickets for that will be going on sale this next month. Please contact us if you have questions and if you will have 6 or more in your group. 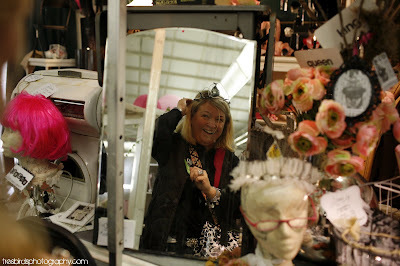 I started Come Junk With Us Where you can be Junk Queen or King for the day or the weekend! 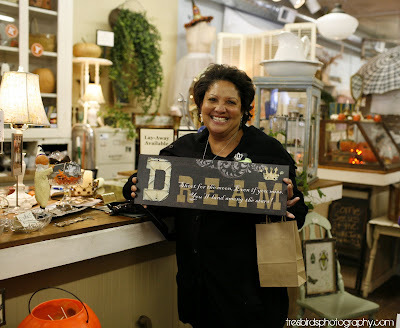 I provide exclusive all inclusive trips to your favorite junkin, and shopping destinations. 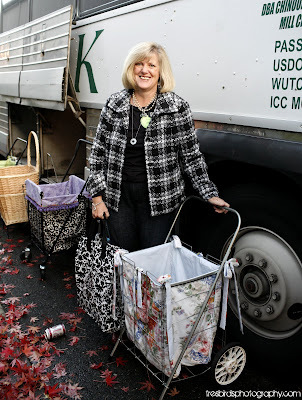 Our Junk Junkets include transportation, hotel accommodations (if required for the Junk Junket), meals, prizes, raffle gifts and more fun than you have had in a long time. 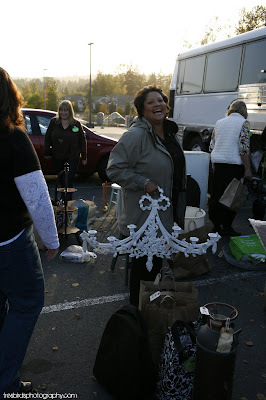 We have regular scheduled trips for some of the hottest flea markets and vintage inspired craft sales in our area. 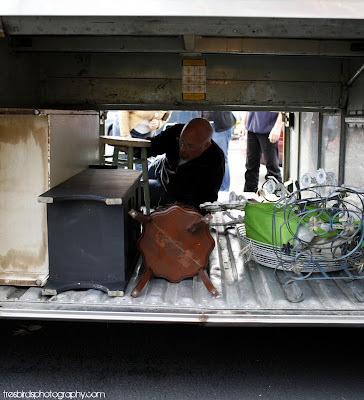 Let us take the work out of finding treasures and bargains so you can have fun. Come Junk With Us! We also do custom trips to fit your group’s needs. 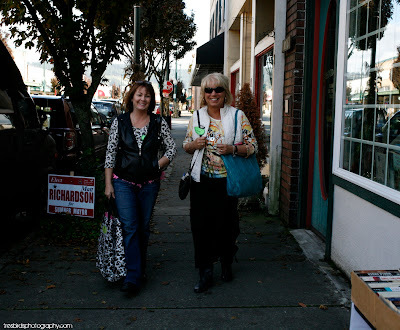 Wineries, beach weekends, shopping, whatever you would like to do. We can customize a trip for you.